If you're expecting Skyrim to just be "Oblivion 2," then you may be rather surprised when you get to play it. Fighting dragons and stealing their souls to compress into phrases of power is pretty exciting, but it's not what you're likely to spend most of your time doing in Skyrim. 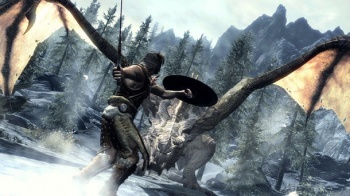 Bethesda's Pete Hines has taken the time to explain what going about your business in Skyrim will actually be like. Hines said that Skyrim was the kind of game where the player spent a lot of time looking at menus, so Bethesda had tried to make them as intuitive and user friendly as possible. Players would also have the ability to assign favorite items, meaning that they didn't need to dive into the menu quite so often. "We spent a lot of time making the game ... more natural," he said. "I think that all of that has been really successful and the game plays really fluidly as a result." Lock picking had received something of an overhaul, with Bethesda borrowing - which is to say, stealing - the lock picking mechanics from Fallout 3. Hines said that Fallout 3's system was more intuitive, and actually felt a lot more like actual lock picking than Oblivion's system. Hines said that dungeons would be much improved in Skyrim as well. Bethesda had hired a lot of level designers, he explained, so not only would the dungeons be well made, there would be a lot of them. Finally, he explained the game's new crafting system. Players would be able to mine ore, and then turn it into ingots. Those ingots, along with leather harvested from Skyrim's creatures, could be used to create new weapons and armor, or reinforce and upgrade existing gear, and what players could make was linked to their smithing skill. Players would also be able to cook their own food, which would be better than what they'd find just lying around. Hines stressed that players would never need to make dinner or forge a sword, but if they wanted to, they could. Skyrim is shaping up to be a rather deep RPG. For all the consternation about the simplification and streamlining of the stats and skill systems, it looks like Bethesda is adding in quite a lot actual gameplay content to make up for it.